Add relaxing in the cozy CorLiving Oakland collection to your exciting summer plans. The PPO-801-L Corner Seat with deep back will help you create the sofa/sectional configuration you desire for your backyard setting. It features a comfortable generous size and the Textured Black resin rattan weave is complimented by high quality, weather resistant foam seat cushions wrapped in washable Dove Grey woven seat covers. Upon delivery, just add the legs and its ready to use! Its easy to complete your deck with a comfortable Oakland series patio set from CorLiving. Relax in style with this foldable 3pc bistro set from CorLiving. The sleek lines and powder coated aluminum frame of the PJR-372-S create an elegant look, while the wide slat surface offers a comfortable seat. Constructed from durable engineered polymer material, this set has the appearance of bleached wood without the necessary upkeep and is UV resistant which prevents discoloration. This set is expertly constructed to withstand a range of climates. The PEX-263-Z 5pc outdoor bar height bistro set from CorLiving welcomes back the days of Mission design, which was popularized in the Southwest during the early 20th century. The contemporary approach to this classic aesthetic is what sets this stylish arm chair and table set apart. From the clean lines to the emphasis on showcasing the wood grain. Durable wooden frames have been treated to withstand the elements while the black cushions offer a comfortable seat to enjoy cold drinks on a hot summer day. Oakland Patio Corner Seat in Textured Black Weave Add relaxing in the cozy CorLiving Oakland collection to your exciting summer plans. The PPO-801-L Corner Seat with deep back will help you create the sofa/sectional configuration you desire for your backyard setting. 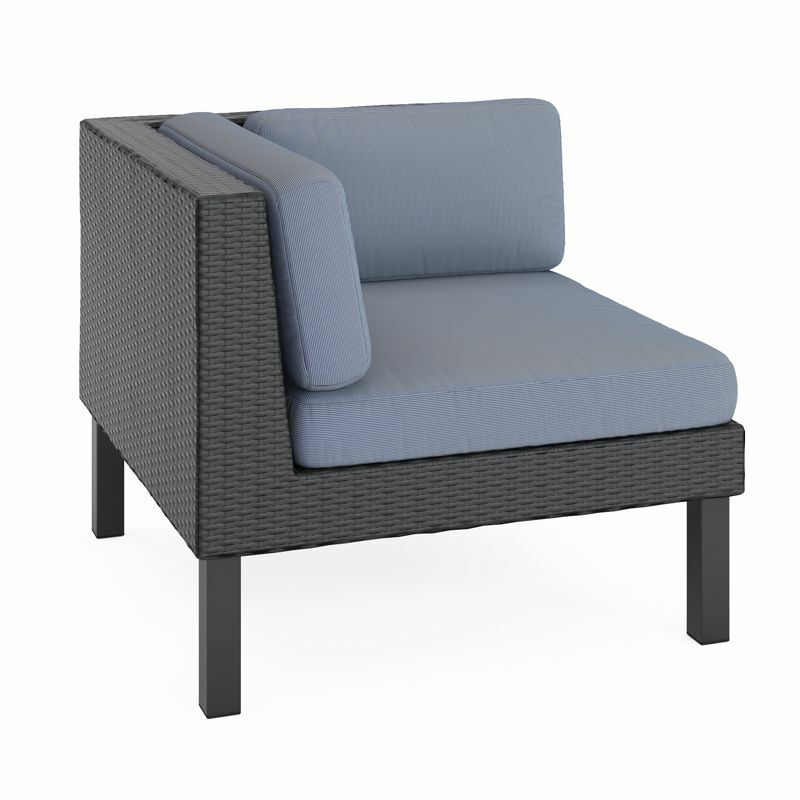 It features a comfortable generous size and the Textured Black resin rattan weave is complimented by high quality, weather resistant foam seat cushions wrapped in washable Dove Grey woven seat covers. Upon delivery, just add the legs and its ready to use! Its easy to complete your deck with a comfortable Oakland series patio set from CorLiving.